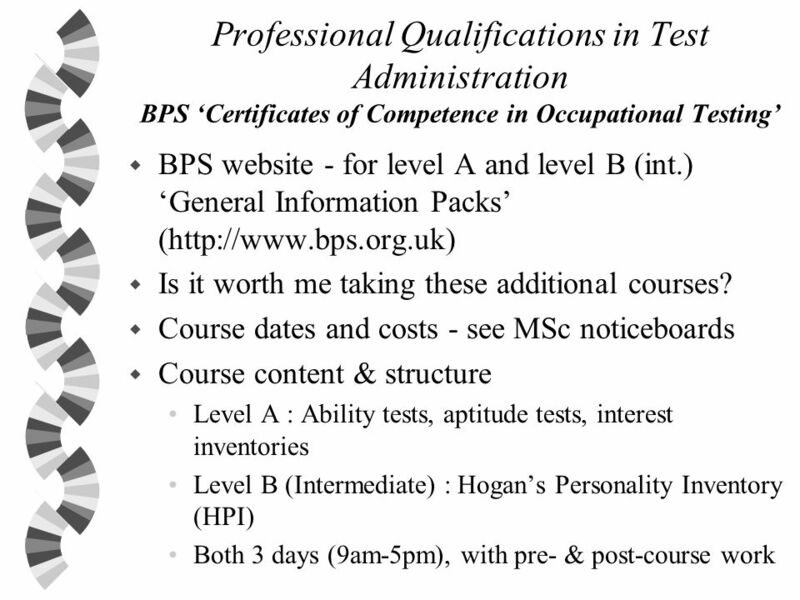 Utility Analysis & Professional Qualifications in Test Administration BPS Level A and Level B (intermediate) courses Assessment in the Workplace. 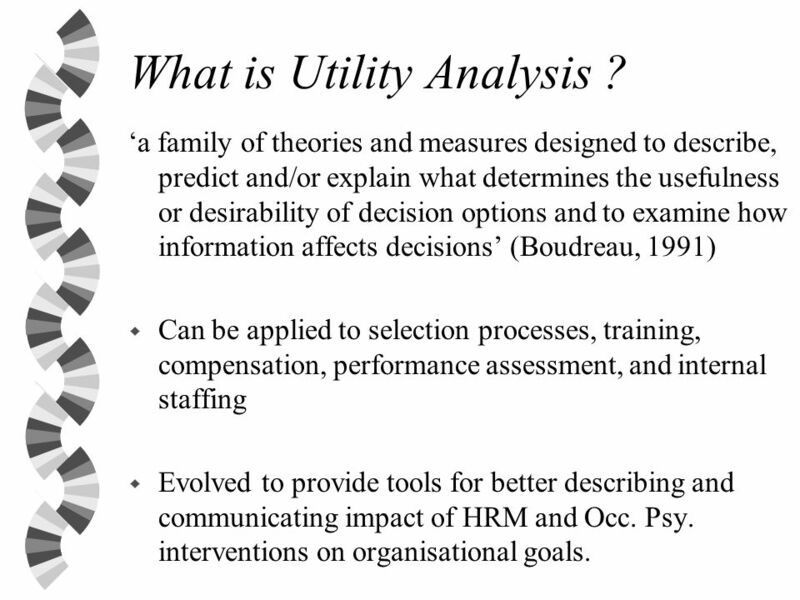 3 What is Utility Analysis ? 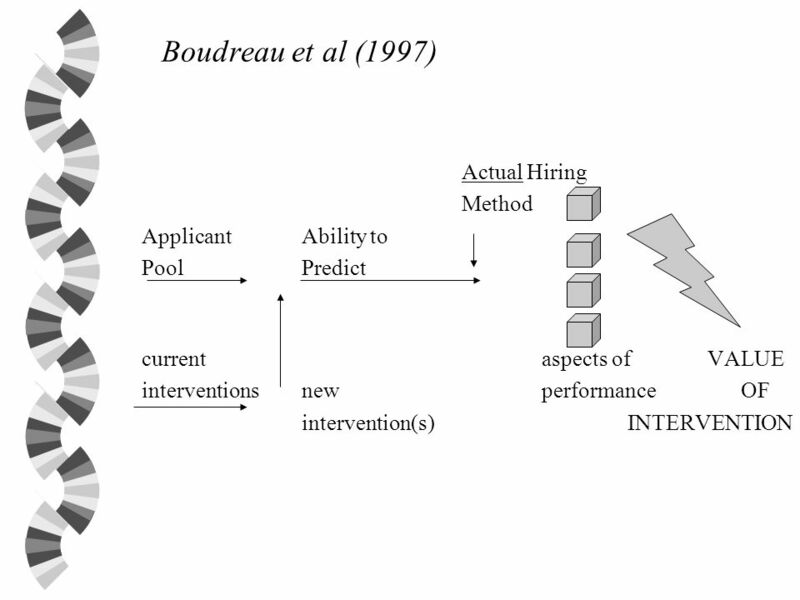 a family of theories and measures designed to describe, predict and/or explain what determines the usefulness or desirability of decision options and to examine how information affects decisions (Boudreau, 1991) w Can be applied to selection processes, training, compensation, performance assessment, and internal staffing w Evolved to provide tools for better describing and communicating impact of HRM and Occ. Psy. interventions on organisational goals. 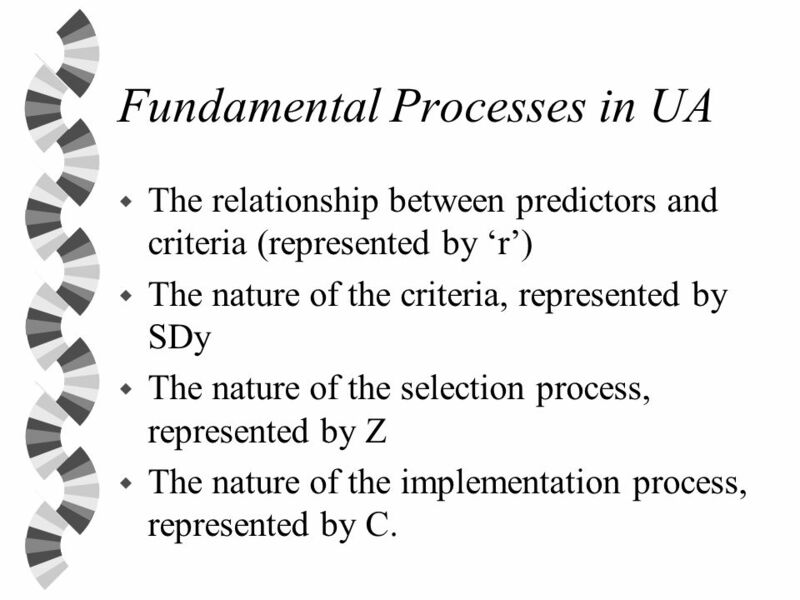 5 Fundamental Processes in UA w The relationship between predictors and criteria (represented by r) w The nature of the criteria, represented by SDy w The nature of the selection process, represented by Z w The nature of the implementation process, represented by C.
7 How much more is a good worker worth than a poor worker (i.e. 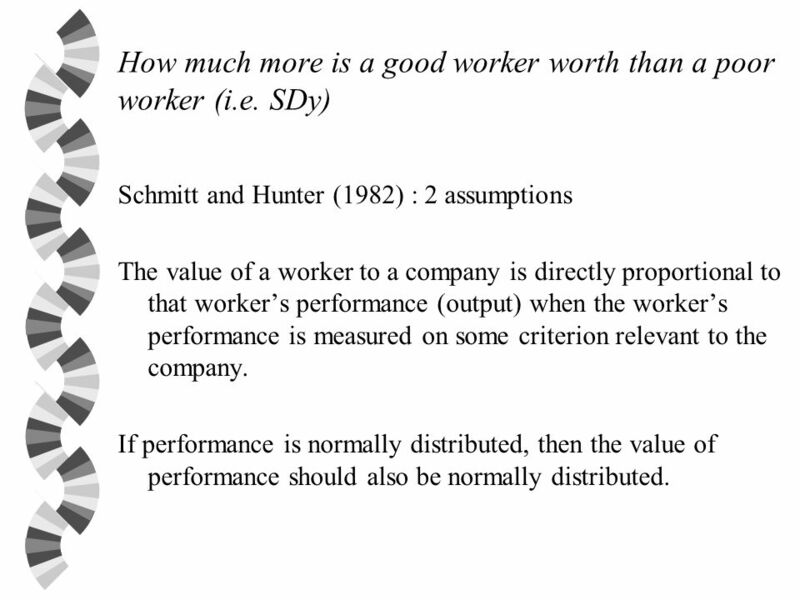 SDy) Schmitt and Hunter (1982) : 2 assumptions The value of a worker to a company is directly proportional to that workers performance (output) when the workers performance is measured on some criterion relevant to the company. 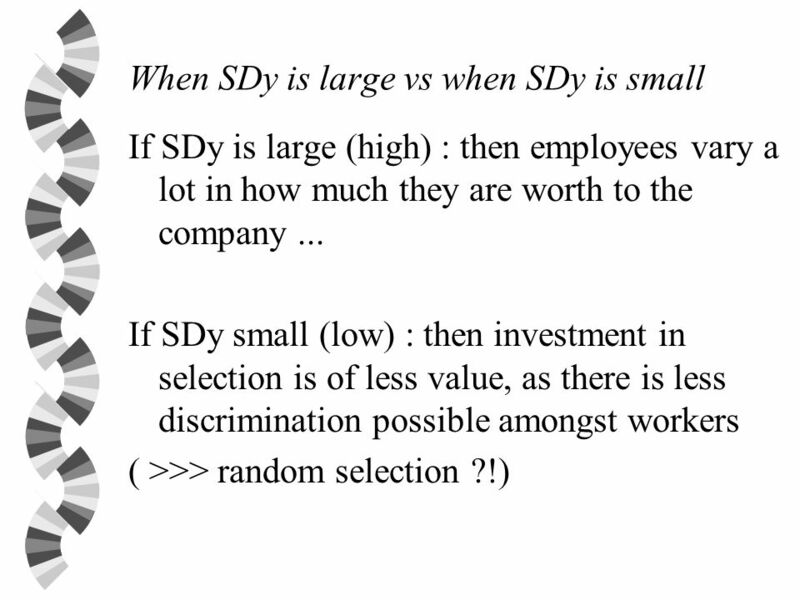 If performance is normally distributed, then the value of performance should also be normally distributed. 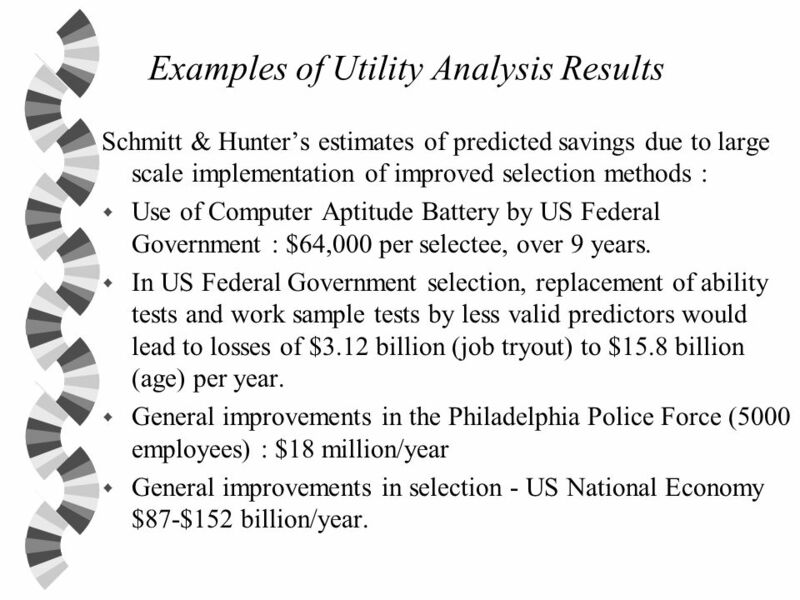 10 Examples of Utility Analysis Results Schmitt & Hunters estimates of predicted savings due to large scale implementation of improved selection methods : w Use of Computer Aptitude Battery by US Federal Government : $64,000 per selectee, over 9 years. 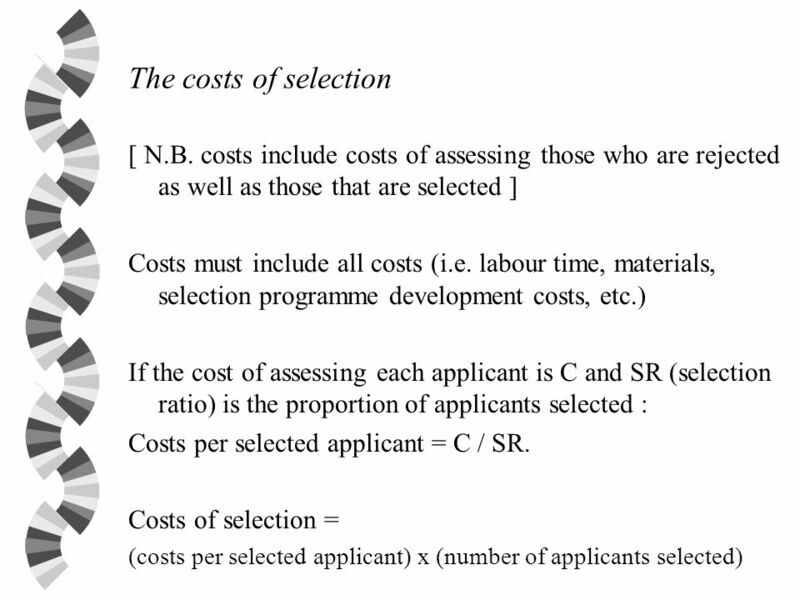 w In US Federal Government selection, replacement of ability tests and work sample tests by less valid predictors would lead to losses of $3.12 billion (job tryout) to $15.8 billion (age) per year. w General improvements in the Philadelphia Police Force (5000 employees) : $18 million/year w General improvements in selection - US National Economy $87-$152 billion/year. 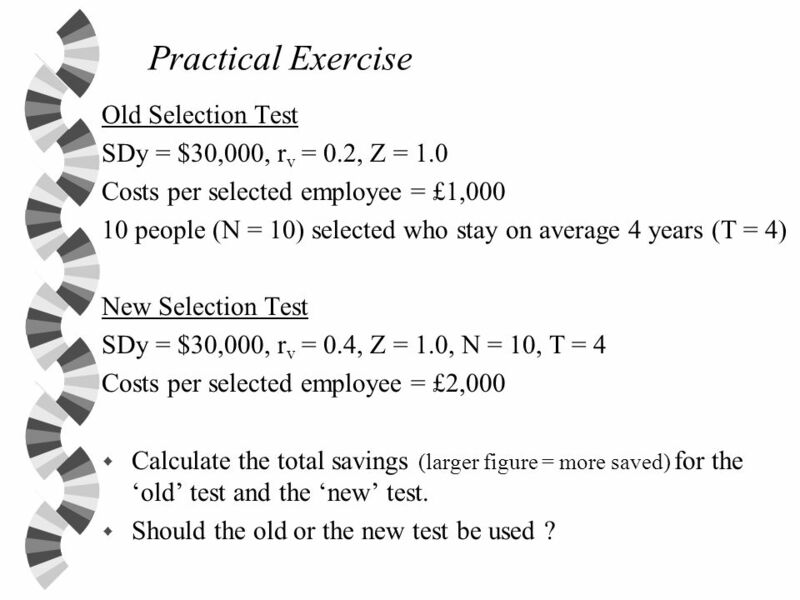 11 Practical Exercise Old Selection Test SDy = $30,000, r v = 0.2, Z = 1.0 Costs per selected employee = £1,000 10 people (N = 10) selected who stay on average 4 years (T = 4) New Selection Test SDy = $30,000, r v = 0.4, Z = 1.0, N = 10, T = 4 Costs per selected employee = £2,000 w Calculate the total savings (larger figure = more saved) for the old test and the new test. w Should the old or the new test be used ? 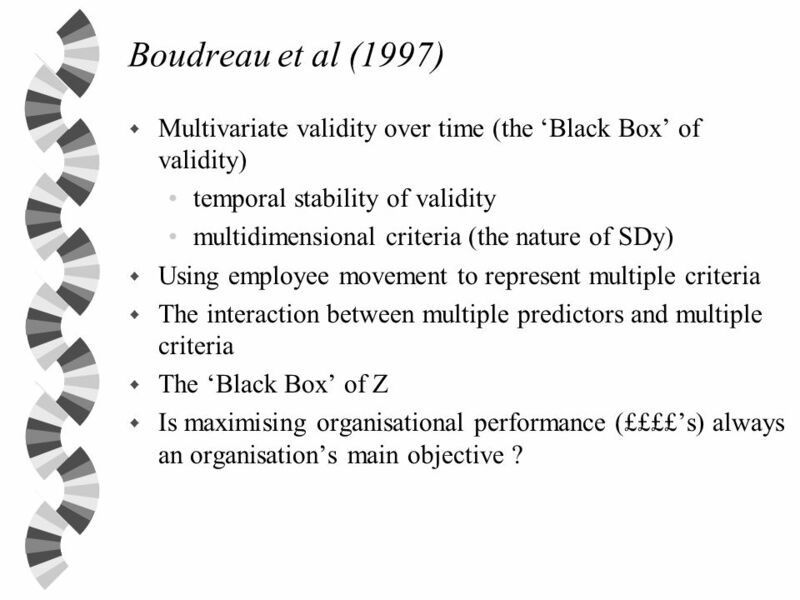 14 Boudreau et al (1997) w Multivariate validity over time (the Black Box of validity) temporal stability of validity multidimensional criteria (the nature of SDy) w Using employee movement to represent multiple criteria w The interaction between multiple predictors and multiple criteria w The Black Box of Z w Is maximising organisational performance (££££s) always an organisations main objective ? 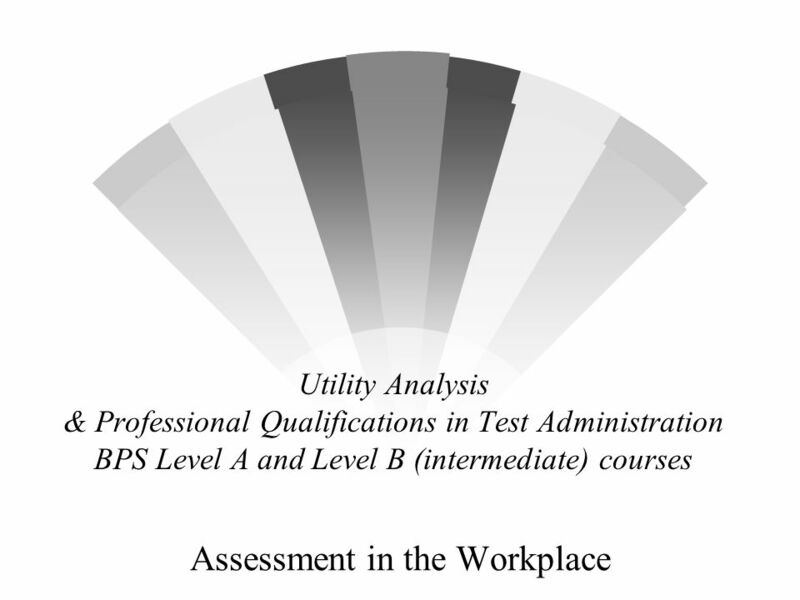 Download ppt "Utility Analysis & Professional Qualifications in Test Administration BPS Level A and Level B (intermediate) courses Assessment in the Workplace." About Certiport Worldwide administrator of the Microsoft Business Certification program: –Microsoft Business Certification Credentials Microsoft Office. Copyright © 1999 Harcourt Brace & Company Canada, Ltd. Chapter 7 Selection Falkenberg, Stone, and Meltz Human Resource Management in Canada Fourth Edition. Nuttall Consulting. 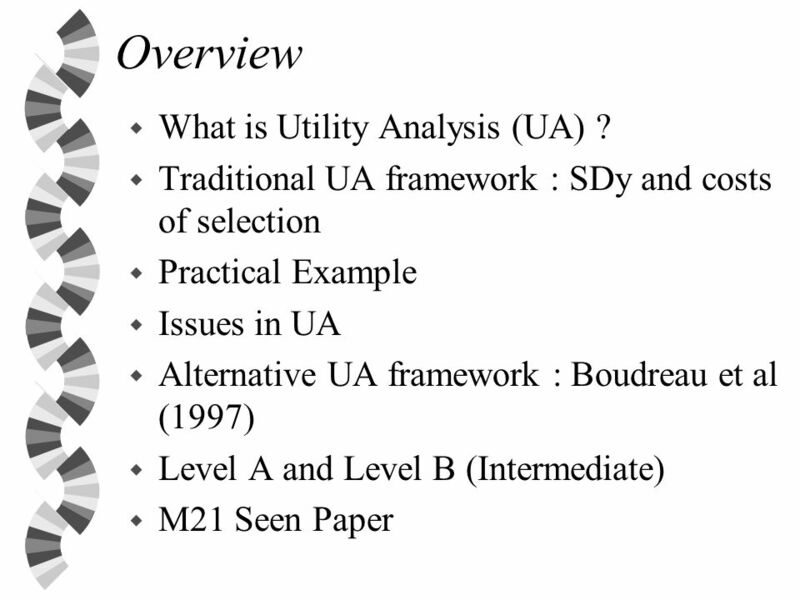 Purpose overview of the form and use of the AERs repex tool Not Detailed reference material on the underlying spreadsheets Defence. The Return on $taffing Review Quantify the Financial Impacts on staffing spend vs. value with powerful new tools from BDT International. How do you spend. Cost estimation - Cost behavior What we really want to understand is how spending will vary in a variety of decision settings. Cause-effect relations and. 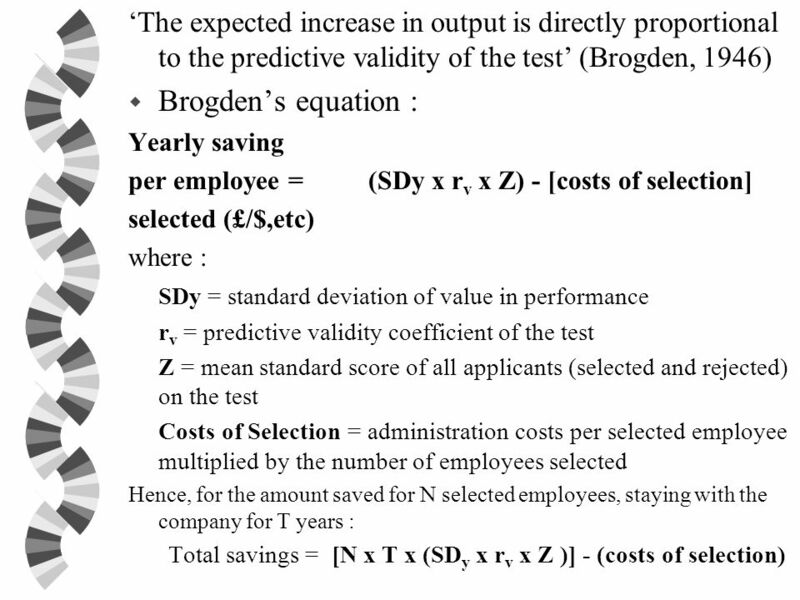 4/4/2015Slide 1 SOLVING THE PROBLEM A one-sample t-test of a population mean requires that the variable be quantitative. A one-sample test of a population. Managing Human Resources, 12e, by Bohlander/Snell/Sherman © 2001 South-Western/Thomson Learning 5-1 Managing Human Resources Managing Human Resources Bohlander. 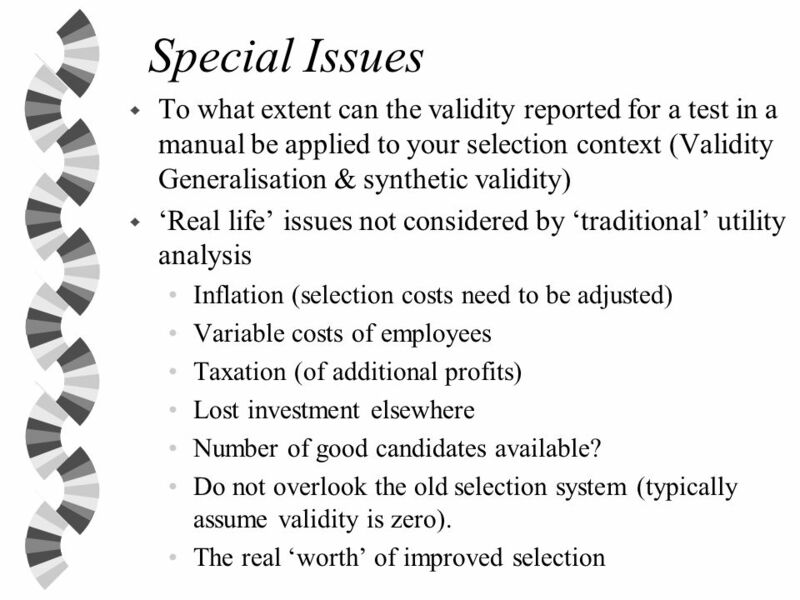 Concept of Reliability and Validity. Learning Objectives  Discuss the fundamentals of measurement  Understand the relationship between Reliability and. 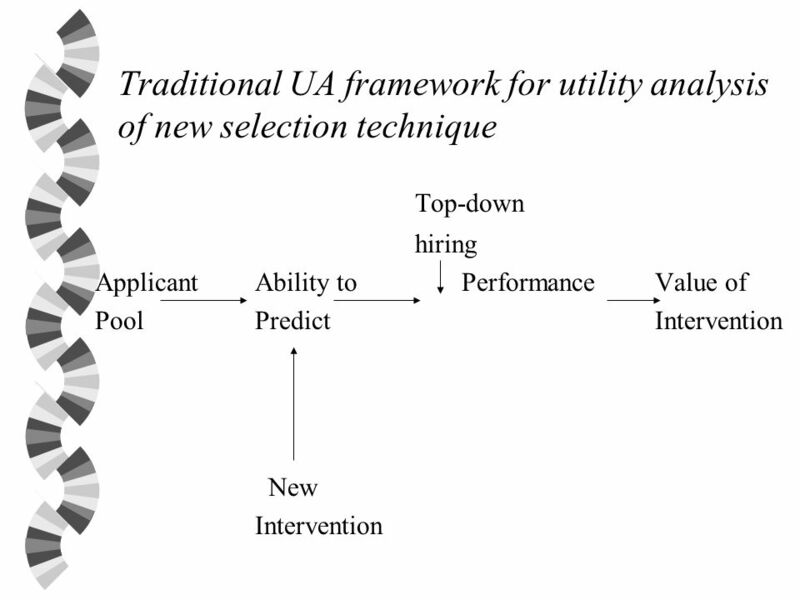 Effect of Selection Ratio on Predictor Utility Reject Accept Predictor Score Criterion Performance r =.40 Selection Cutoff Score sr =.50sr =.10sr =.95.